Elisabeth Marchhart is a reliable and versatile contact person to her customers as well as for the employer branding team. Concepts for a unique employer brand, target group oriented recruitment marketing campaigns, authentic social media communication – she supports her team at multiple projects. She puts special emphasis on a high level of service and consultancy for her customers. 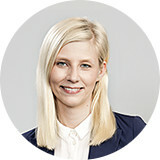 Before she started at Iventa, she graduated with a degree in media and communication consulting at FH St. Pölten, and gained corporate experience in an Austrian trading company.